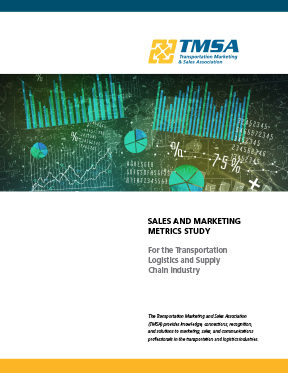 Minneapolis, Nov. 26, 2018 – The Transportation Marketing & Sales Association (TMSA) is seeking companies in the commercial freight transportation industry to participate in its 2019 annual sales and marketing metrics study. The goal of this ongoing research project is to help sales and marketing professionals gain a better understanding of key sales and marketing metrics, how these metrics change over time, and best practices in the industry. Initiated in 2014, this study each year provides metrics in marketing and sales staff and budget sizes in the transportation industry, as well as department structure and performance. Specifically to sales, the study monitors factors that identify optimum sales leads, quotas and cost/performance metrics, hiring and training, CRM and sales automation technology. In marketing, the study identifies metrics such as where marketing dollars are invested in the transportation industry, outsourcing trends, and tracking and ROI assessment. New this year, the TMSA metrics study will benchmark social media usage, email open and click rates, and ad click rates. “Given the tremendous influx of digital marketing initiatives in the industry, it’s critical that we monitor how effective the industry is implementing, executing and measuring such digital metrics,” said Brian Everett, CEO of TMSA. He also highlighted that with the importance of customer service and customer experience (CX) being elevated in enterprises within the transportation industry, additional questions about these metrics are being asked in this year’s survey. In fact, CX will be a focus on the theme for the TMSA’s Logistics Marketing & Sales Conference, which will take place June 9-11, 2019, at the Omni Amelia Island Plantation Resort near Jacksonville, Fla.
Any marketing or sales leader within the transportation industry should complete the online survey by Jan. 11. All responses are completely confidential and will be reported only in aggregate form. Individual responses are not tied to companies and this data is never shared with any other party. To participate in the survey, visit TMSAtoday.org and then click TMSA Sales & Marketing Metrics Study under Quick Links.